While Peru might be famous for being home to Machu Picchu and stunning rainforests, the bi-weekly Peru Tinka lottery serves up a different kind of awe and wonder—especially if you’re lucky enough to win one of its highly coveted jackpots. 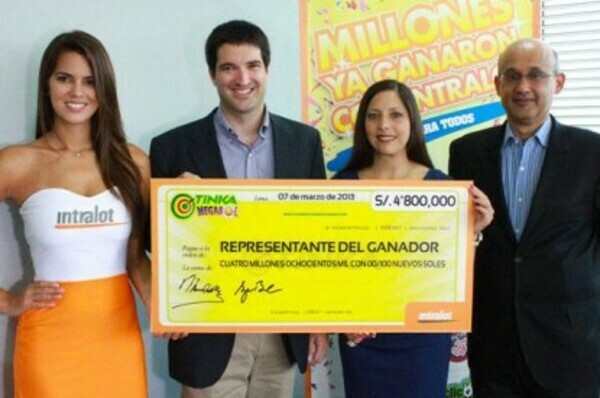 Peru’s most popular lottery game, Tinka features good odds and a jackpot that starts at 1.5 million Sol (€405,539). If you’re wondering whether Tinka is worth playing, join us as we dig deep into this game and find out what it’s all about below. Founded on October 16, 1994, Peru Tinka has now been around for almost 25 years. During this time, it has turned more than 125 people (“Tinkeros” as they’re called locally) into millionaires—that’s an average of five per year!—and it shows no sign of slowing any time soon. Despite its relatively old age, the game’s format has remained exactly the same, which is nice because many other great lotteries have tweaked their mechanics every few years, often gradually toughening their odds of winning as they did so. But not so with Tinka: what you see is what you get. Always. 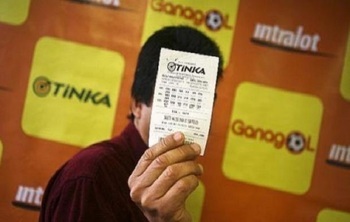 Tinka is operated by Intralot de Perú SA, which prides itself on how transparent Tinka and its other games are, as well as the global lottery standards that it adheres to. As Intralot also operates Peru’s primary sports betting scene, it does a lot of good for the people of Peru in terms of raising funds for various community endeavours and social causes around the country. Tinka follows the popular 6/45 game format common to many other lotteries around the world. This format requires players to choose 6 numbers, as well as a bonus number called the Boliyapa, from a range of 1 to 45. Though the Boliyapa has no significance in terms of who wins the jackpot since all that’s needed for that is to match the main six numbers that are drawn, it does dictate who wins the second, fourth, sixth, and eighth prize tiers. Peru Tinka is a rollover lottery, meaning its jackpots will continue rolling over until there is a winner. There is no cap on its jackpot size nor the number of times the jackpot can roll over. Peru Tinka’s odds are typical of most 6/45 style lotteries—and that’s a good thing. Having a 1 in 8,145,060 chance of winning millions (and an overall 1 in 13 chance of winning any prize) is really not too shabby, considering there are many lotteries out there that have much tougher odds and not necessarily much better prizes. Other lotteries with the same odds include Australia Saturday Lotto and Australia Monday Lotto, Hungary Hatoslottó, and Austria Lotto 6. However, the jackpots of most of these other lotteries tend to be a bit bigger than Tinka’s. As for lotteries with much better odds, a few that are worth checking out include Chile Clasico Loto (1 in 4,496,388), Italy MillionDAY (1 in 3,478,761), and Mexico Melate Retro (1 in 3,262,623). Peru Tinka’s lottery draws are held every Wednesday and Sunday evening at 9:30 pm (PET) at Intralot’s HQ in the country’s capital, Lima. The results are aired on TV, radio, and the Internet immediately after they take place. Winners have exactly 180 days to claim their prizes from the day the draw takes place; any windfalls (like the jackpot prize discussed in more detail below) not picked up by that time are considered forfeited and are donated to support communities and social-welfare causes around the country. *This jackpot is particularly worth mentioning not just because of its size but because no one ever showed up to claim it! As the days turned into weeks and the weeks turned into months, more and more news outlets started covering this story in the hopes that somebody would show up by the 180th day to claim their prize, but no one ever did. We hope that whoever the real winner was never realized what they missed out on, because that would be a terrible life-long burden to bear! Tinka’s payout options for all of its prize tiers are limited to a single lump-sum cash payment. Even though there is no annuity option available, we highly doubt that any foreign player would want to deal with collecting international winnings for decades—that would definitely be much more hassle than it’d be worth. All Tinka prizes are subject to the same 10% tax rate that all other lotteries and games of chance in the country are subject to. Depending on where you live, your winnings may or may not be taxed again after you transfer them back into your domestic bank account. Every country has a different policy regarding how lottery winnings are taxed, with some countries taking a huge chunk of winnings and others not taking even a single penny. If you’re not sure what your country’s policy is, doing a bit of research will be well worth your time. If you wish you could get in on the Peru Tinka action but aren’t planning to visit the Incas any time soon, fret not because several of the best online lottery sites do offer it—as well as many other awesome international lotteries. While this is not only a much cheaper way of playing than flying all the way to Peru, it also comes with many perks, including subscriptions, syndicate/group play, scanned tickets (so you never have to worry about losing them, like that one winner mentioned above), and more. Peru Tinka – Is It Worth Playing? Tinka’s motto is “Play Tinka and make your dreams come true”, but does that hold any weight? Based on our analysis, we think it does. While the game’s jackpots obviously can’t compare to the likes of the world’s biggest lotteries, they are still very respectable. On top of that, Tinka’s solid odds, eight prize tiers, and cheap price of admission make it a game that’s worth checking out. Though I haven't tried it yet, Peru Tinka seems like a pretty sweet lottery! Thanks for introducing me to it.